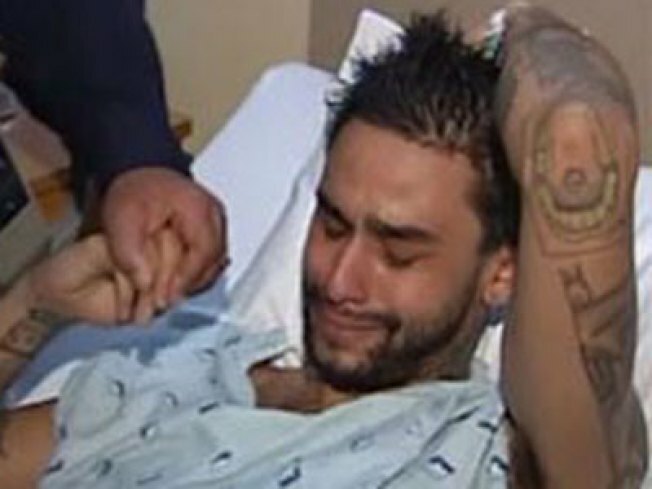 Michael Mineo in the hospital after he was allegedly assaulted by NYPD officers. A grand jury has reportedly decided to indict three NYPD officers in connection with the beating and sodomizing of a man with a two-foot baton during an arrest at a Brooklyn subway station. According to published reports, one of the officers is 25-year-old Richard Kern, who faces an assault charge. A transit officer reportedly told a grand jury he saw Kern use the baton on 24-year-old Michael Mineo while two other officers held Mineo down. The alleged assault happened in October, when Mineo was arrested for allegedly smoking marijuana outside the Prospect Park subway station. Mineo's lawyers and the Rev. Al Sharpton spoke with reporters. Mineo thanked a lot of people, including a police officer who "broke the blue wall of silence" and didn't back the police story, instead saying the victim did not make this up. Sharpton said the officer may be the hero of this case. An NYPD investigation originally found the case did not have any grounds, but now a grand jury has reportedly indicted the officers believed to be involved. Sharpton said there needs to be some level of police reform -- some unbiased "nonpolice" agency should review police, not "police policing themselves." Mineo said, "I'm pleased" when asked about news of indictments. His lawyers emphasized this is a marathon and it is only the beginning. There are plans to file a civil lawsuit against the officers involved and the NYPD.